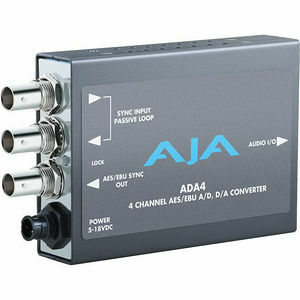 The ADA4 is a 4-channel converter that can be configured as a 4-channel A/D, a 4-channel D/A, 2-channel A/D and 2-channel D/A, or an AES synchronizer. The included breakout cable provides the audio connections for ADA4, allowing 8 channels of AES audio input and output while keeping the overall size of the Mini-Converter compact and portable. ADA4 accepts an AES11, wordclock or video sync/color black reference input for synchronization. Reference input and synchronization are automatic with a passive looping reference as well as a separate AES sync output. Easy-to-access DIP switches allow the audio levels on ADA4 to be configured quickly and clearly while in the midst of a production.